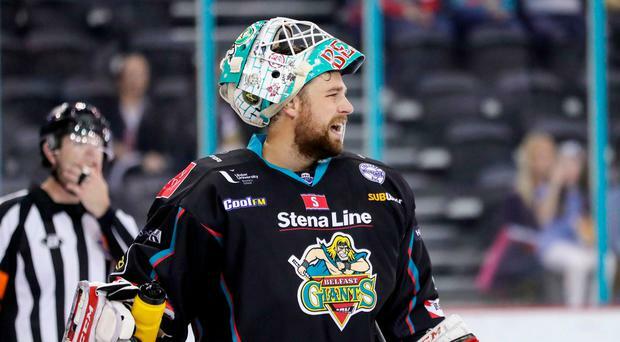 Adam Keefe is relishing what he describes as "the best of both worlds" after seeing goaltender Tyler Beskorowany excel on his first weekend as a Belfast Giants player. The signing of the 28-year-old, who played 15 times for the Edinburgh Capitals last season, not only gives Keefe a strong twosome, with long-serving Stephen Murphy on board for a ninth season at the SSE Arena, it means he can tweak his line-up to suit either the opposition or the current circumstances as the season goes on. With 15 imports on his roster and Elite League rules dictating that only 14 can dress on game night, the option to start Murphy, who missed almost all of last season through injury, will undoubtedly come into play during a long season, but after two outstanding displays in the wins against Dundee Stars and Fife Flyers last weekend, Beskorowany is expected to get the nod in tonight's return game against the Stars, despite the arrival of Hunter Bishop tipping Keefe over the import limit. "I have seen Tyler over the last few weeks in practice and the games against Manitoba before last weekend and I am happy that he is a very capable goaltender and I think it's a great tandem to have with Tyler and Stephen Murphy," said Keefe. "We know that we have one of the top British goaltenders in Stephen Murphy and we also have one of the top import goaltenders in Tyler Beskorowany. "For us it's the best of both worlds and it changes the way that we can look at the line-up each night and can share the load. This league has become so competitive now that I think it's a two-goalie league and they need to share the load to get through the extensive schedule. "We have done the maths and we could play upwards of 80 games this season and that's a lot of games for one goalie to handle." After starting their defence of the Challenge Cup with those back-to-back victories last weekend, two more wins against the Stars tonight and in tomorrow's game against Glasgow Clan will put the Giants in pole position to reach the quarter-finals and also set them up perfectly for the league opener at home to the Nottingham Panthers on Wednesday. Depending on how things go this weekend, Murphy may see competitive action for the first time in a year and Keefe expects him to push the new arrival all the way as the season progresses. "As of right now we will be looking for them to share the load and there will be a bit of healthy competition between them as well to battle it out for the big starts and we'll see where that ends up," said Keefe. "When Stephen Murphy can play Andrew Dickson would back-up when possible and that would allow us to dress 14 import skaters and when Tyler dresses we'll have Stephen Murphy and that's something I have to get my head around and think about. "It makes me have to think about the line-up each weekend and strategically about how we work the line-up, whether it be Friday/Saturday, Saturday/Sunday or, as we have on some occasions this season, Friday, Saturday and Sunday. We'll see who is fatigued, who needs to come out and who needs to rest."